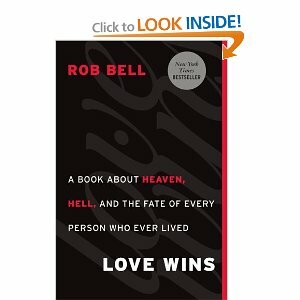 Let me just give it to you as I think it is: With “Love Wins” Rob Bell wins. It’s not a real scholarly read, though I think Bell has done his work in the books. It’s not a theological treatise, though I think it reflects some good theology and theological thinking. And it’s not a big enough book to answer all the great questions it poses or all the choice questions it makes you come up with on your own. And that’s a good thing, really. All in all, it’s a win. And the critics? The ones who jumped to condemn Bell before the book was even published? Shame. Shame on them. Now that’s not to say that you have to agree with everything that Bell says or concludes. I don’t really think Bell expects all of us to agree. But it’s partly because of the divisive and judgmental voices like those earliest critics that I think Bell wrote this book. Those sometimes mean-spirited voices are often the ones framing our narrative. They are often the mixed message of love and grace until you are found wanting in some area of thought or theology, and then it’s the guillotine, baby! And yes, I spelled guillotine without any help from my spell-checker! What is Bell trying to do? He’s trying to help us make a coherent narrative of our faith, our scriptures, our hopes and our fears. And he’s doing it in the middle of a highly connected, pluralistic world scene in which the predominant “belonging system” model of faith has not always prepared us to exist and contribute. Do I agree with Bell? Pretty muchly yeah, I do. ‘Cause I’m very comfortable with the Cosmic Christ stuff from Fr. Rohr and I always side with C.S. Lewis on matters of substance. And because I am not terribly happy with the limitations of the belonging system faith we so often give lip service to while quietly hoping for something more, something bigger and something gorgeously unexpected. Thank you Rob! Nicely done! This entry was posted in Devotional Thoughts and tagged book review, Christ, Heaven, Hell, Love Wins, Rob Bell, theology. Looking forward to WILD GOOSE 2011!